Can you identify the football player in this photograph? 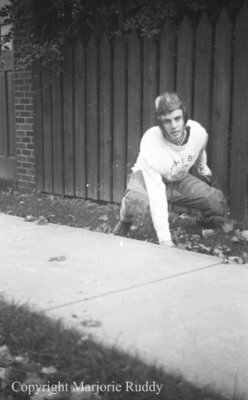 A black and white negative of an unidentified boy wearing his school football uniform and posing in his football stance. There is a wooden fence in the background behind him. On the front of his uniform is "Whitby High School". Unidentified Football Player, c.1939, Marjorie Ruddy. Whitby Archives A2013_040_882D.